Domum is the debut album by Aija Alsina, a Latvian pianist/composer and sound designer now living in London, where she is completing an MSc in Composition for Film and Media. Not surprisingly, Alsina’s music is very visual, emotional and expressive. The twelve original pieces on the album were created over a four-year period. They are varied and have simple titles that suggest a place, an experience or a feeling. Most are solo piano, but a few tracks feature piano accompanied by violin (Shannon Stott-Rigsbee), cello (Daniel Gonzalez), and/or French horn (John Stacy). 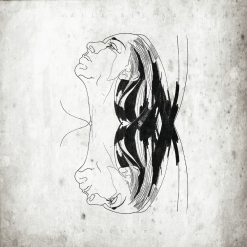 The simple but beautifully-evocative line drawing on the album cover is original artwork by Evija Saitere. The title is Latin for “homeward” in reference to Alsina’s return to the piano as well as her struggle to find her own unique musical expression. Aija Alsina started experimenting with music on her grandparents’ piano when she was six and is mostly self-taught. Music was a hobby until she left Riga for Barcelona in 2013, leaving behind a day job in finance and band mates in Gaserata, a Latvian post-rock collective. Alsina started working on her debut album there, and then moved to London in 2015. She has written scores and worked on soundtracks for various genres of visual media from film to fashion shows. She was one of the ten finalists in the prestigious Marvin Hamlisch Film Scoring Contest in 2016 and was invited back as a judge in 2017. I would say that the future looks very bright for Aija Alsina! Domum opens with “Break Away,” a piece that begins with a dark and rather ominous theme that really draws you into the music. Graceful and full of longing, it’s an intriguing start! “Embrace the Silence” is mysterious and also a bit on the dark side. The repetitive left hand pattern is almost hypnotic as the more melodic right hand tells its story. “French Waltz” begins with a feeling of tragedy or mourning. The tempo is slow and the melody is heartfelt and very sad. As the piece progresses, the tempo gradually increases and the mood lightens. John Stacy adds haunting tonal color with his French horn on this piece. “Healing” is one of my favorites. Layers of keyboard sounds (mostly piano) plus strings (Daniel Gonzalez and Shannon Stott-Rigsbee) create a mysterious yet magical setting that is simple yet complex (with the layering) - and very poignant. I also really like “Love Letter,” a deeply emotional and achingly beautiful outpouring of the soul. The other three instrumentalists add their own magic to the piece. “My Favorite Book” is spare, but emotionally very rich. Strings here and there add some lovely embellishments. “Reflection” uses reverb and layering to create a somber yet spacious setting. Some of the reverb makes me think of ripples on otherwise smooth water while gazing at a reflected image. The latter part of the piece becomes more percussive and intense - fascinating! Aija Alsina has created a very impressive debut album with Domum! I’m so glad the piano has recaptured her imagination and that she is able to share her musical gifts with the world! The album is available from Amazon, iTunes, and CD Baby. Recommended!